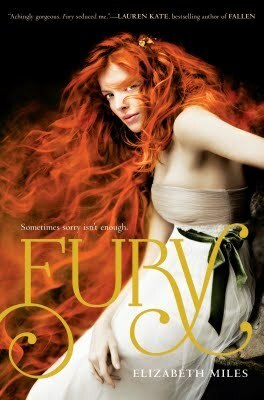 Review: First off, I want to thank Good Choice Reading for giving me the opportunity to read Fury for an arc tour. I was very excited to get this book in the mail, and blown away with the cover. I remember seeing pictures online of what the cover of the book looked like, but in person, it doesn't do a justice. I was blown away... the beautiful, long red hair (who I'm assuming on the cover is Ty) will catch anyone's eyes, the gorgeous dress (which I'm determined to find something similar ;-) haha). The gold letters on the title "Fury" tie the cover together- entire cover gives the reader a sense of what this book could be about in terms of feelings and genre; because to me, it screams dark and mysterious. The story takes place in a town named Ascension- which given the idea of this book and the events that come about, the name of the town ties in nicely- just a little something to think about. Elizabeth Miles, the author, does a wonderful job at giving subtle hints into a storyline... enough to make a reader feel on edge or uneasy, but not enough to give anything big away... Just yet! The characters in this book are what I'd describe as typical high school teenagers, very cliche; parties, awkward secret love triangle with the best friend's boyfriend, football team- which increases a person's popularity if you are associated with it, and last but not least cliques- jocks, nerds, goth, etc. << this is everything that I think of when I think of high school unfortunately and Fury has exactly that. I believe several underlying messages could be taken out of Fury, the biggest one being "What goes around comes around." Some people really do believe this; for those people who are good to others, then others will be nice and they will have a happy life in return. For those who are cruel, they will eventually have to pay for their actions in some way or another. Elizabeth, goes about this in Fury, but in extreme circumstances... to the point that the characters are being taunted by three sisters... Furies... who have existed for a while and come back to take revenge on those who deserve it the most. I enjoyed Fury, and I'm looking forward to continuing the series. I am very interested to read what happens next in regards to Em and the tie she has with the Furies. When it comes to witches, spirits, myths, etc I get a little uneasy and scared- to say this book had me up parts of the night thinking over what happened and the events that played in the novel, would be an understatement. This book is probably geared more towards older teens in regards to the context! I loved this book as well! I love the revenge plot.